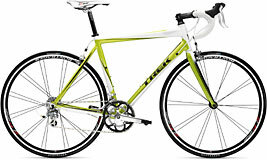 Spokes has one of the area's largest selections of road bikes from all your favorite brands at one location, including Specialized, Fuji, Kestrel and Kona. All bikes are professionally assembled by qualified technicians and carry a complete warranty from the manufacturer. Our knowledgeable staff offers professional sizing and computerized bike fitting to get the most out of your ride. Learn more about the style of bike best suited for your type of riding by reading below, or click on any of our manufacturers' links to see the full line-up of exciting new bikes. Entry level usually translates to: "get me started for as little $$$ as possible"! Most of our brands make a very good starter bike at a modest price. Today's technology makes it possible to have accurate shifting at a lower cost than ever. These bikes typically feature lightweight aluminum frames with a geometry that is user-friendly, but feature handlebars which allow you to get low and out of the wind at higher speeds. As the manufacturer adds carbon material in key locations, the ride improves and the price goes up accordingly. Overall, this category gives you a lot of road riding fun for less bucks. Full carbon fiber is today's premium. There are many steps in between entry level and full carbon fiber. Carbon fiber makes for an unbelievable ride! It smoothes out the rough, dampens irritating vibration and is super lightweight. Today's carbon lay-up manufacturing techniques allow the frame to flex where you want it and be firm where needed. Carbon is the premium ride  and also one of the most expensive materials. 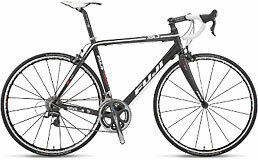 These bikes are usually coupled with lighter and even more precise shifting as the cost goes up. Many manufacturers mix carbon and aluminum to either reduce overall cost or make the bike perform a certain way. 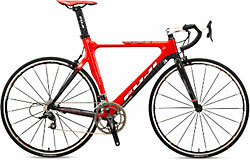 Many different frame geometries are available from fun and very relaxed to an aggressive race position. 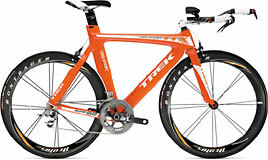 Road racing bikes typically put comfort on the back burner and feature a geometry that provides frame stiffness to accelerate quickly in an all-out sprint, turn instantly and have a very low and crouched body position for high speed. The priority is to put all of the rider's power to the ground with very little energy loss due to inefficiency. Various price points exist with different types of frame materials including scandium, carbon fiber, OCLV (Trek), titanium and various mixes. The right choice depends on the rider/racer's budget and likings. Most road racers use strategy and drafting (i.e, getting out of the wind behind another rider), so wind resistance is somewhat important, but not the most important. These bikes are the most aerodynamic bikes available. Most are wind-tunnel tested and are made specifically for this purpose and sometimes have an "unusual" look. Triathlons are combination races of running, swimming and biking (or other). Time trials are just the rider, bike and how fast he or she can complete the race course. The racers may not have the option to draft so the wind is their biggest challenge, since they are all alone for the most part. The "aero bars" allow the rider to get extremely streamlined during the race, reducing their drag. The areo bars can be an add-on for a road racer who wishes to do some triathlon or time trial racing.